Let us explain a bit more how each of the scientific challenges we are confronted with in the quantum lab at Aarhus University are translated into the game. The building blocks of a quantum computer are called qubits (quantum bits). 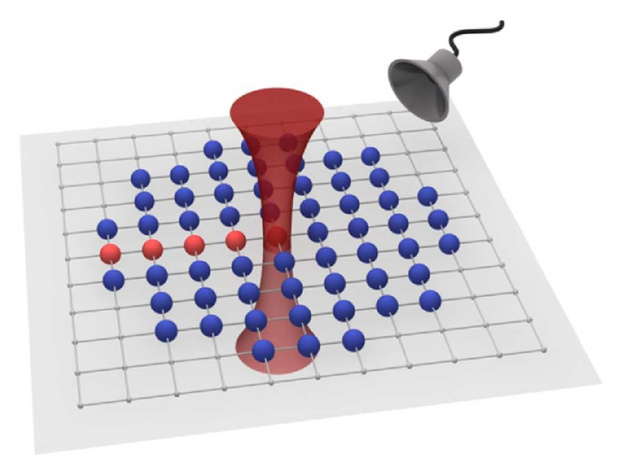 In our experiment, the qubits are an array of individual atoms arranged in an optical lattice. 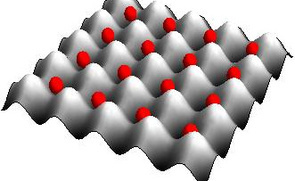 You can think of an optical lattice as of an egg-tray made out of light instead of carton. An extremely cold gas of atoms, reaching temperatures of approximately -273,15 °C, is placed in the lattice. 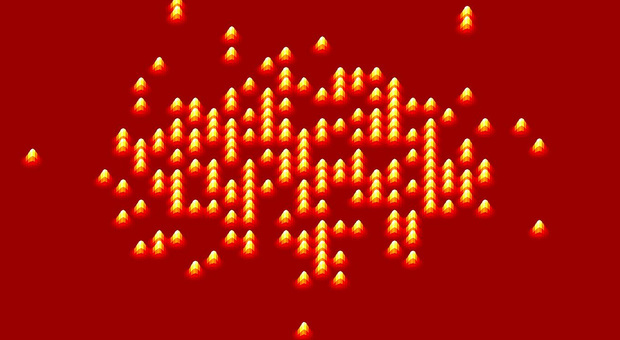 Then, by tuning the parameters of the lattice, one single atom is placed in each well of the lattice. In the quantum lab, we use controlled ultra-focused laser beams, also referred to as optical tweezers, to "grab" the atoms in the lattice. Think of the ultra-focused laser beam as a cone! Have a look at the image below: the red cone is the light of an ultra-focused laser, which can manipulate a single site in the lattice that corresponds to about 500 nm wide. This is the equivalent of an approximately 1/1000 of the width of a hair. Every time a laser beam is focused on a specific atom, a well is created. While our ultra-focused laser moves correspond to you moving the mouse sideways in the game, the up and down mouse moves corresponds to decreasing and increasing the intensity of the laser. To make quantum calculations, we need to be able to grab one specific atom, move it around in the lattice and place it on top of another atom. Grab the atom by pointing a ultra-focused laser on it. Move the laser and thereby the atom. Transport the atom in the 'highways' of the optical lattice (sections of the lattice from here the atoms are removed) and merge two atoms in order to make them interact. In order to make the quantum calculations without errors it is important that the atoms do not 'slosh' when moved (they may 'slosh' meanwhile being moved, but not at their final position). You can think of the "slosh" as a bucket full of water that, even though it has really been agitated, it should not be spilling over when you place it in its final position. In physics terms, the atoms 'slosh' when exited from their stationary states which happen every time energy is conveyed to the system. And there is a final challenge: time! All operations must be completed within a span of seconds. Even though it would be perfect to have infinite time, there is no such thing in quantum physics. This is where you can help us a lot as well by becoming a master of time! That is all! Now all you have to do is play! Quantum Minds on Mac or PC.